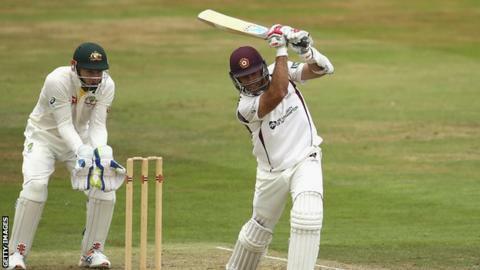 Northants have released Scotland international Kyle Coetzer and bowler Maurice Chambers. Former Scotland captain Coetzer, 31, joined Northants in 2011 and helped the side win the FLt20 in 2013. But Coetzer, who went to the World Cup with Scotland earlier this year, only played four Championship matches this summer, with a batting average of 5.29. Meanwhile, 28-year-old paceman Chambers moved from Essex in 2013 and played just five Championship games in 2015. Northants head coach David Ripley told the club website: "Kyle has been a model professional during his time here, he deals with success and failure in equal measure, a very valuable thing in a cricket dressing room. We wish him and his family well in the future. "After a slow start in 2014, Maurice has put in a big effort this year but has been unable to get past our other seam bowlers and play regularly in the first team."